In the spring of 2017, Dimitris Papaioannou and his ten performers premiered their first display of the breathtaking visual production, The Great Tamer, at the Onassis Cultural Centre in Athens, Greece. Since then, this production has travelled to a multitude of countries in Central Europe and Asia, leaving its viewers in tremendous awe and feeling gravely inspired to exhaust our lives and to give everything we can before leaving this world. The production encompasses the human condition, revealing the small tragedies and great absurdities of our modern lives through classic theatrical conventions. 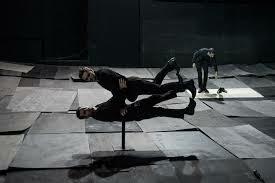 Papaioannou has chosen to use unique techniques to manipulate simple props, ultimately creating illusions that engage with the material and the metaphysical of life on our current world. With Ann Arbor, Michigan being one of only two locations that this production is being performed at in the United States, I am anticipating this event highly. I am excited to feel the tragedy and the frivolity that other reviews have promised and to feel enlightened by an orchestrated presentation of the universal emotions common among all of us.